Chances are you’ve never heard of Del Close—and if you have, it’s probably a fair indication that you spend a lot of time watching, practicing, or thinking about improvisation. Not the kind where you have to quickly make up an excuse for your boss about why you’re late for work, or invent the name of a non-existent dive bar to throw your bestie off the scent of what you really did last night—no, we’re talking “improv,” the word bandied around to apply to a collection of theatrical training games that has become an entertainment form in its own right and made millionaires out of many of your comedy favorites. Some of them, including Bill Murray, Tina Fey, Mike Myers, John Belushi, and Chris Farley, studied, at one time or another, under a man named Del Close. 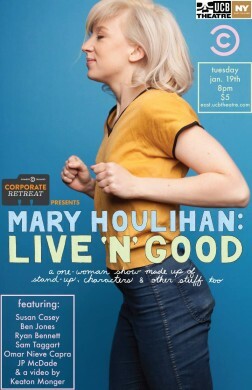 If you’ve ever even considered seeing a comedy show at venues like Muchmore’s, Over the Eight, or the Annoyance, chances are you’ve seen Mary Houlihan up to something there. I met Mary while we were both performing at a variety show in Bushwick. Since then, we haven’t been much more than Facebook acquaintances, but I started seeing her name practically everywhere as a part of all sorts of silly and fun-sounding shows. Even her Facebook presence reflects a lighthearted and delightfully cartoonish proclivity. When I heard that she was doing her own one-woman show, Live ’N’ Good, for a second time, I knew I wanted to see what was going on in that head of hers. So, we met up for pizza in Williamsburg and got to chattin’. This week, you can eat turkey and see shows. I guess you could do that any week, but it’ll feel more significant now. “This is that hipster neighborhood I’ve been hearing all about,” carped St. Geegland (played by John Mulaney), addressing the packed house at the Kings Theatre in Flatbush. At this UCB series, comedians present their research in a lecture format, but don’t expect to nod off like you did in college. The show is guaranteed to be “100% Factual. 100% Hilarious.” This installment features Jared Logan, Kara Klenk, and Jim Tews. 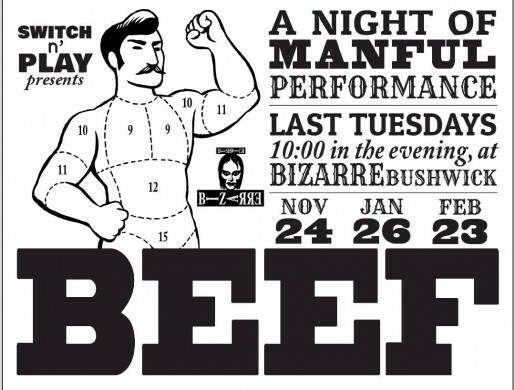 Sure, comics are notorious navel-gazers, but the fun themes at these recurring shows encourage them to dig for more than just belly button lint. The latest installment of this series, “You Don’t Have To Go Home But You Can’t Stay Here,” promises to be worth the price of admission. This show about getting kicked out of bars, being the last loser at a party, “the pursuit of fun,” and stupid decisions will feature Isaac Oliver, Ophira Eisenberg, Nancy Balbirer, Kate Greathead, Lynn Bixenspan and host Blaise Allysen Kearsley. A scattering of camera-wielding press members sat in a darkened Upright Citizens Brigade theater last Friday, awaiting the arrival of the UCB 4 (founders Amy Poehler, Matt Besser, Ian Roberts, and Matt Walsh) and the start of the 17th Del Close Marathon “press conference.” This was, of course, a rather loose term for what unfolded, as minutes prior to the start, an improv-enthused audience flooded the theater, swallowing the “press” whole. I hate to say it, but I can sort of imagine Natasha Vaynblat, when she was Ms. Vaynblat, coming off at first as the teacher who could be walked all over. She’s nice, cute, and says things like “oh my gosh” with complete sincerity, but her unassuming nature belies her comic demeanor. During her four years as a teacher (she left the job in 2013, for comedy), Natasha loved to prank her students. In “United Federation of Teachers,” her first one-woman show at UCB Chelsea, the audience gets to see both her victories over troublemakers and her hilarious miscalculations, all of which remind me of the myriad reasons why I’ll never willingly put myself in charge of children. B+B spoke with her over the phone about her experiences and her new show.